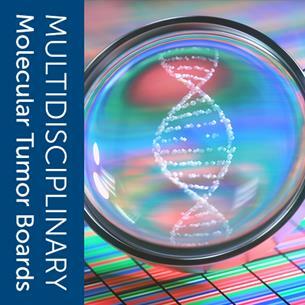 Participant Instructions: Welcome to the Multidisiplinary Molecular Oncology Tumor Board Series! This educational initiative is a collaboration between the American Society of Clinical Oncology (ASCO), College of American Pathologists (CAP), and Association for Molecular Pathology (AMP). A new case will be presented bi-monthly with discussions led by an expert pathologist and medical oncologist. This month’s topic is led by Drs. Jason Westin (Hematologist/Oncologist from MD Anderson) and Alexandra Kovach (Hematopathologist from Vanderbilt). Do you have an interesting case in mind? Submit your hypothetical patient cases for consideration in an upcoming Multidisciplinary Molecular Tumor Board discussion forum. Participants are encouraged to leave comments and post questions about the case in order to generate a wide discussion among the cancer care community. You can also receive email notifications when new comments are posted by clicking the “Follow this Conversation” option located at the bottom of this page. A 62-year-old woman with history of hypertension and monoclonal B-cell lymphocytosis (MBL) presents to your clinic with asymptomatic cervical, supraclavicular and inguinal lymphadenopathy. Her ECOG performance status is 0, and her LDH is elevated at 675 U/L (upper limit of normal 225). Excisional lymph node biopsy is performed. A preliminary pathology report gives a diagnosis of large B-cell lymphoma, pending FISH studies for final WHO subclassification. The final pathology diagnosis returns as high-grade B-cell lymphoma not otherwise specified (HGBCL-NOS). Bone marrow biopsy is negative for HGBCL-NOS; flow cytometry of bone marrow aspirate material detects the patient’s known MBL. PET/CT shows additional widespread hilar, mediastinal, and retroperitoneal lymphadenopathy. 1. How are diffuse large B-cell lymphoma not otherwise specified, high-grade B-cell lymphoma with MYC and BCL2 and/or BCL6 rearrangements, and high-grade B-cell lymphoma not otherwise specified defined by the 2016 revised WHO Classification of Lymphoid Neoplasms? 2. What is your plan for first-line therapy? What other clinical or laboratory information would you gather before beginning therapy? How will you monitor treatment response? 1.- The group of high-grade B-cell lymphoma with MYC and BCL2 and/or BCL6 rearrangements, and high-grade B-cell lymphoma not otherwise specified are defined as High-grade B-cell lymphomas, with and without MYC and BCL2 or BCL6 translocations. The group of diffuse large B-cell lymphoma not otherwise specified is defined as mature B cell neoplasms including CCO (germinal center B-cell type and activated B-cell type) and double expresors without MYC, BCL-2 or BCL-6 rearrangements. 2.-My first treatment option would be R-CHOP. In the absence of translocations there is no scientific evidence that DA-EPOCH is superior to R-CHOP. In case of good response after 6 cycles I would consider maintenance with lenalidomide. The plan for first-line therapy for this patient is somewhat controversial due to lack of definitive clinical trial results. This patient has an International Prognostic Index (IPI) score of 3 (age, stage, and LDH), which is consistent with high-risk disease. Having the FISH results for MYC, BCL2, and BCL6 would be helpful, but often these are not immediately available. The standard therapy for newly diagnosed DLBCL is R-CHOP (CHOP established in 1976, rituximab added in 2002). There have been multiple studies evaluating novel chemotherapy combinations, variations on CHOP, and additions of novel agents to the CHOP backbone. To date, none of these studies has shown superiority to R-CHOP. Many clinicians consider a risk-adapted approach, looking to the IPI as a validated tool to guide therapy. Low or intermediate risk patients typically do well with R-CHOP therapy, but only 55% of high-risk patients are cured with this approach. To evaluate if an intensified approach could improve outcomes, a recent randomized phase III trial compared R-CHOP with R-EPOCH in newly diagnosed DLBCL patients. Unfortunately, the trial demonstrated no statistical difference in all patients; however, subgroup analyses are ongoing. The standard therapy for high-grade B-cell lymphoma, NOS (HGBCL-NOS) is less well defined, primarily as the group has just recently been defined by the WHO. Many lymphoma physicians treat medically fit patients with an intensified chemotherapy program for HGBCL-NOS, similar to Burkitt lymphoma, although there are no phase III data to support or refute this approach. A small single center series found outcomes to be similar between R-CHOP and intensified approaches, but this was not a randomized trial. The standard therapy for high-grade B-cell lymphoma with MYC and BCL2 and/or BCL6 rearrangements (“Double Hit Lymphoma”) has been studied in several large retrospective analyses, but not in a prospective randomized phase III trial. The retrospective analyses found that intensified induction regimens (e.g., R-EPOCH) had a higher proportion of response and survival; however, patient selection biases could impact these results. As relapsed Double Hit Lymphoma has dismal outcomes with standard options, consolidative autologous stem cell transplant in first complete response has been utilized; however, more recent analyses have demonstrated that patients with a complete response to an intensified induction regimen do not receive further benefit from consolidation. Most lymphoma physicians would agree that an intensified approach is warranted in Double Hit Lymphoma if the patient is medically fit. If a patient is initially diagnosed with DLBCL or HGBCL-NOS and is later found to have translocations consistent with Double Hit, our practice is to change therapy from R-CHOP to R-EPOCH to complete a total of 6 cycles. Diffuse large B-cell lymphoma, not otherwise specified (DLBCL-NOS) encompasses tumors of large, variably pleomorphic B cells with an intermediate to high proliferation fraction, no EBV expression, and no combination of MYC and BLC2 and/or BCL6 rearrangement. Certain clinicopathologic subtypes of large B-cell lymphoma (e.g. primary CNS lymphoma, DLBCL leg type) are so defined and excluded from DLBCL-NOS. It has long been recognized that not all systemic DLBCLs are created equal: germinal center B-cell origin versus non-germinal center B-cell (activated B-cell) origin by gene expression profile or, more commonly, by immunohistochemical screen (CD10, BCL6, and MUM1, the cell-of-origin Hans classifier) is an expected component of the pathology report for DLBCL-NOS, given that activated B-cell type has historically been considered to have a more aggressive clinical course than germinal center type. Indeed, in many cases of DLBCL-NOS, the lymphoma cells morphologically resemble centroblasts (germinal center-origin B cells) whereas other cases recapitulate immunoblasts (post-germinal center, activated paracortical B cells). Isolated MYC rearrangement does occur in a subset of DLBCL-NOS. High-grade B-cell lymphoma with MYC and BLC2 and/or BCL6 rearrangement (HGBCL-R, “Double Hit Lymphoma” or occasionally “Triple Hit Lymphoma”) is defined by cytogenetic rearrangements in its name, typically assayed by fluorescence in situ hybridization (FISH). Much has been learned about the prognostic significance of MYC and other gene rearrangements in large B-cell lymphomas other than Burkitt lymphoma, and a number of retrospective studies have shown that HGBCL-R has an inferior prognosis to that of DLBCL-NOS. Many cases of HGBCL-R show morphologic features intermediate between DLBCL and Burkitt lymphoma: pleomorphism more than typical of Burkitt, but hyperchromasia and high proliferation fraction (“starry sky”) as seen in Burkitt. Indeed, HGBCL-R tends to be of germinal center origin by gene expression profile and Hans classifier, as is Burkitt lymphoma, but cell-of-origin classification is not a component of its definition since the cytogenetic rearrangements are thought to drive its relatively aggressive behavior. Other cases show blastoid morphology. Blastoid variant of mantle cell lymphoma must be excluded (typically accomplished by immunohistochemical assessment of cyclin D1 protein), as must B-lymphoblastic leukemia/lymphoma (by TdT immunohistochemistry and further flow cytometric immunophenotyping). Several studies have investigated whether immunohistochemistry could be used to screen for rearrangement status, since FISH assays are not readily available in every center, among other logistic and financial reasons. In summary, MYC and BCL2 (over)expression by immunohistochemistry are not perfectly sensitive nor specific for MYC and BCL2 cytogenetic rearrangement status such that most centers are performing MYC, BCL2, and BCL6 FISH on all new diagnoses of large B-cell lymphoma. These studies led to the recognition that dual overexpression of MYC and BCL2 by themselves, in the absence of underlying rearrangements, also appears to portend a less favorable prognosis than standard DLBC-NOS but not as dismal as that of HGBCL-R. This is the so-called “double expressor” phenotype and, while not currently a formal component of the WHO classification, is increasingly being incorporated into diagnostic reports for DLBCL-NOS, as it may have greater prognostic implications than the now traditional cell-of-origin schema. High-grade B-cell lymphoma, not otherwise specified (HGBCL-NOS), the case in this vignette, is arguably the most difficult to diagnose given its heterogeneity, its basis in cytomorphology, and therefore its tendency toward greater interobserver variability among hematopathologists than the other entities. As cases of HGBCL-R are recognized with overlapping morphologic and immunophenotypic features of DLBCL and Burkitt lymphoma, so too are cases with these overlapping features that are not “Double” or “Triple Hit.” They may show Burkitt lymphoma-like morphology (monomorphous, highly proliferative) but without its typical immunophenotype (CD10+, BCL2-) or cytogenetic (isolated MYC rearrangement) characteristics. Conversely, they may have an isolated MYC rearrangement but clinical, morphologic and immunophenotypic features not typical of Burkitt lymphoma or of DLBCL. Importantly, they may exhibit blastoid cytology, but mantle cell lymphoma and lymphoblastic lymphoma have been excluded, and a BCL6 rearrangement is detected amid non-specific karyotypic abnormalities. The 2008 provisional entity “B-cell lymphoma, unclassifiable, with features intermediate between diffuse large B-cell lymphoma and Burkitt lymphoma” is now defunct and has been replaced by “HGBCL” terms, splitting off “Double Hit Lymphoma” from the wastebasket, albeit now smaller, category of HGBCL-NOS. As with prior WHO updates, the goal of the 2016 revisions in aggressive B-cell lymphomas was to define clinicopathologic entities with distinct biologic characteristics such that they can be studied and treated uniformly in research and clinical settings, respectively. Further studies are needed to determine how application of the diagnosis HGBCL-NOS informs clinical management. FISH studies detect translocations involving MYC and BCL2 and multiple copies, but no rearrangement, of BCL6. The pathologist updates the final diagnosis to high-grade B-cell lymphoma with MYC and BCL2 rearrangements (“double hit” lymphoma; HGBCL-R). The patient has already completed 2 cycles of R-CHOP, and interim PET scan shows a complete response; R-CHOP is continued to complete 6 cycles. At a follow-up visit 4 months after the 6th cycle, the patient reports new symptoms. Imaging studies identify a 5-cm lymph node in the retroperitoneum, bilateral 3-cm axillary lymph nodes, and an L2 vertebral lesion, concerning for lymphoma relapse. 1. What additional pathology testing, on tumor or blood, would be potentially useful? 2. What treatment options are available for relapsed high-grade B-cell lymphoma with MYC and BCL2 rearrangements (HGBCL-R, or “double hit” lymphoma)? Biopsy of an accessible lymph node to confirm relapse is highly suggested. The unlikely but real possibilities that the new (post-treatment) lymphadenopathy could represent a reactive condition (e.g. lymphoid hyperplasia, granulomatous disease, other infectious process) or even a separate neoplasm (e.g. outgrowth of low-grade chronic lymphocytic leukemia/small lymphocytic lymphoma, CLL/SLL, related to the patient’s previously documented MBL) could be considered. As at diagnosis, core or excisional biopsy should be performed. If available, the diagnostic (original biopsy) material should be reviewed in conjunction with the repeat biopsy. Fine needle aspiration (FNA) could even be considered under certain circumstances, since overt morphologic evidence of relapse is unlikely to require extensive immunophenotyping. FISH studies do not need to be repeated. Morphologic similarities between the time points can confirm a diagnosis of relapse, particularly when technical factors affect immunophenotypic modalities (e.g. poor viability of large B cells by flow cytometry, inadequate control samples for particular immunohistochemical stains). Importantly, the emergence of antigen-directed therapies for relapsed lymphoma often requires demonstration that the antigen of interest is expressed by the lymphoma cells. For example, the B-cell antigen CD19 is the target of most B-cell-directed chimeric antigen receptor (CAR) T-cell therapies, as discussed below, such that CD19 expression must be demonstrated on the lymphoma cells for approval or clinical trial eligibility. CD19 expression is most frequently demonstrated by flow cytometry; in situations where flow cytometry does not detect the cells of interest (a common pitfall for large-cell processes), immunohistochemistry for CD19, available at some large and reference laboratories, may be applied. Our case turned out to be “double hit,” even though it was not a “double expressor” (there was not expression of both MYC and BCL2 protein by immunohistochemistry). This underscores the difficulty in screening for rearrangements by protein expression (immunohistochemistry). One resource-conserving strategy that some centers with a large volume employ is to begin with MYC FISH, and only if that is positive, reflex to BCL2 and BCL6 locus FISH. For smaller centers that may batch FISH assays once or twice a week, however, reflex testing may increase the turn-around time to a final diagnosis of “double hit” lymphoma that it may not be desirable. To date, DLBCL-NOS with isolated MYC rearrangement does not appear to differ in prognosis from DLBCL-NOS without a MYC rearrangement. The proliferative advantage of cells with MYC translocation coupled with the anti-apoptotic drive from BCL2 translocation is thought to drive the aggressive behavior of “double hit” lymphoma. Lastly, emerging diagnostic modalities are likely to apply to relapsed lymphoma in the future. Circulating tumor DNA (ctDNA) is a very promising non-invasive method of monitoring of malignancies and other conditions. Indeed, ctDNA studies in large B-cell lymphoma have shown that detection of tumor DNA in peripheral blood may precede imaging changes. Treatment could therefore be informed by relatively frequent interval monitoring of disease status via peripheral blood samples. Also on the horizon are next-generation sequencing (NGS) panels of lymphoma-associated mutations. Several recent large-scale sequencing studies have proposed novel classifications for large B-cell lymphoma based on mutational characteristics. It remains to be seen whether and which of such panels will enter the routine clinical arena. Clinical trials are underway to address these questions. Early relapse of diffuse large B-cell lymphoma implies a poor prognosis with an increased chance of chemotherapy resistance. This is especially true in HGBCL with MYC and BCL2 rearrangements (“double hit” lymphoma), where outcomes in patients with relapsed or refractory disease are dismal in retrospective series, with 9% survival at 3 years despite aggressive therapies. The standard approach for the patient in our case would be to determine if the patient is fit for aggressive therapy. Approximately half of patients with relapsed DLBCL are determined by their treating physician to be appropriate to begin intensive therapy. The PARMA trial evaluated platinum-based chemotherapy versus platinum-based chemotherapy followed by an autologous stem cell transplant. This trial found a significant improvement in survival outcomes when patients with chemotherapy-sensitive lymphoma were consolidated with autologous stem cell transplant, which has become standard practice for nearly thirty years. The CORAL trial evaluated which platinum-based chemotherapy regimen (RICE vs. RDHAP) achieved better outcomes in patients with first relapse of DLBCL. This trial found the regimens to be largely similar (with the exception of a subset analysis showing a potentially better outcome in DLBCL of germinal center B-cell origin with RDHAP), but depressingly found that patients who relapsed within 12 months and received rituximab with initial therapy had very poor outcomes (~25% event-free survival at 1 year even with aggressive therapy). Unfortunately, most patients who relapse do so within 12 months, and nearly all patients receive frontline rituximab and thus fall in this poor-risk group; therefore, new approaches are needed. Chimeric antigen receptor (CAR) T-cells are autologous cells obtained via apheresis that are then modified, typically via viral genomic insertion, to express a new cell surface receptor targeting a specific antigen. CAR T-cells targeting CD19, a common B-cell antigen, have shown great promise in clinical trials targeting relapsed pediatric B-acute lymphoblastic leukemia/lymphomas (B-ALL) and aggressive non-Hodgkin lymphomas. The FDA has approved two CD19-targeting CAR T-cell products based upon phase II trials with impressive results, and confirmatory phase III trials are now ongoing. The FDA approval label for both axicabtagene cilolecleucil and tisagenlecleucil for DLBCL is for patients who have relapsed after 2 or more previous therapies, and thus our patient in the current scenario would not qualify for CAR T-cell therapy currently. However, there are three phase III clinical trials (NCT03391466, NCT03570892, and NCT03575351) randomizing patients with first-relapsed DLBCL to treatment with standard chemotherapy and autologous stem cell transplant or to CAR T-cell therapy. I would recommend that our patient participate in one of these clinical trials. The revised 2016 WHO Classification of Lymphoid Neoplasms distinguishes diffuse large B-cell lymphoma not otherwise specified from high-grade B-cell lymphoma not otherwise specified and high-grade B-cell lymphoma with MYC and BCL2 and/or BCL6 rearrangements in an effort to standardize diagnosis and study of large B-cell lymphomas with varying degrees of aggressive behavior. FISH studies for MYC, BCL2 and BCL6 loci are recommended for all large B-cell lymphomas at diagnosis because “double hit” lymphoma has significant prognostic and treatment implications, and immunohistochemical screening is neither sensitive nor specific for rearrangement (FISH) status. Emerging technologies, including circulating-tumor (ct)DNA and next-generation sequencing (NGS)-based assays for lymphoma-associated gene mutations are likely to alter diagnosis, monitoring, and prognostication in large B-cell lymphomas in the near future. Diffuse large B-cell lymphoma (DLBCL) is commonly cured with immuno-chemotherapy; however, high-risk patients identified by prognostic models or pathologically defined subtypes have worse outcomes. Patients with high-grade B-cell lymphoma with MYC and BCL2 and/or BCL6 rearrangements, commonly referred to as “double hit” lymphoma, may have worse outcomes and should be considered for intensified treatment approaches. CAR T-cell therapy has great promise in large B-cell lymphoma, but it is not yet known whether CAR T-cell therapy can improve upon standard salvage chemotherapy followed by autologous stem cell transplant.